Hillary Clinton Supporters Don’t Care about the Poor. Identity Politics is their New Religion. I must admit that this election cycle has been eye-opening to me. I woke up to realize that the Democratic Party is in fact far less liberal that I imagined. It is the party of the identity politics left, in the same way that the Republican Party is the party of the religious right. Identity politics and political correctness are the only truly sacred values, to be compromised for nothing else. And it is because of this willingness to betray every other liberal value upon this golden altar identity politics – the beneficiary of which is big money – that we need to start identifying “liberal” support for Hillary Clinton for what it is, a perfect example of “the regressive left”. Maajid Nawaz coined this term regarding the subject of Islam and terrorism to describe well-meaning liberals who will sacrifice all concern for universal human rights in the name of multiculturalism. I believe this example fits because what you are seeing are liberals more than happy to sacrifice every liberal economic value – indeed spend hours upon hours denigrating plans for universal healthcare and free public education as if they are Republicans – in the name of ‘feminism’ and the modern brand of social justice. It has been astonishing and dispiriting to see see how many “liberals” are publicly declaring that they don’t actually much care about the poor. They support “free-trade” – one of the very signature issues fueling the rise of Donald Trump – fully. This morning I listened to an NPR story where Florida mayor Bob Buckhorn showed exactly what side of the free trade debate he stood on. After hearing an interview with a woman exposing just how free trade ruined her life and her marriage, the mayor made it clear that making any such connection was erroneous. BUCKHORN: Well, I think that’s an unfair portrayal of trade in general. I mean, why would we not want to knock down over 18,000 barriers to 40 percent of the world’s global economy? I mean, I think opening up trade is a good thing. I think – we really ought to be focused on how the economy is changing and how the workforce, the skill set needed to compete in a global economy is changing. I don’t know that you could blame trade and opening up opportunities for American jobs and American businesses for that particular situation. 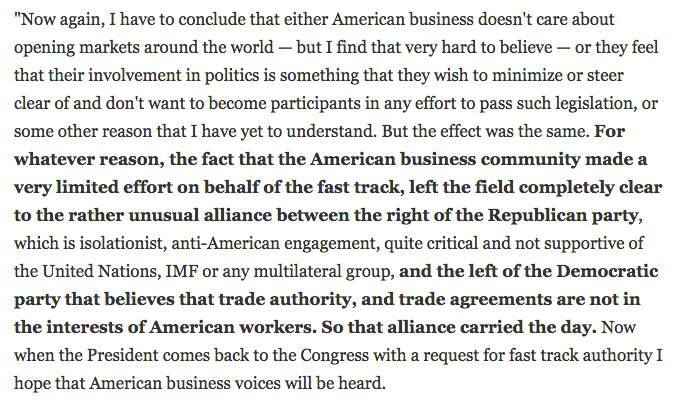 So obviously the trade deals, TPP in particular, have been a long time in the works. Senator Clinton has come out in opposition to that. TPP does correct a lot of NAFTA’s issues. So I think moving forward trade is a good thing. We just have to make sure that the impact on American workers is a positive thing. Indeed, one friend of mine, a friend I had always thought of as a liberal, referred to the loss of the American middle-class completely as “the loss of white privilege”. I can concede that in an earlier age when jobs were plentiful he may have had a point, but whether or not white people had better access to jobs when they were plentiful is different from whether or not these jobs exist at all anymore. Now a “liberal” can be pro war, pro Wall Street, Pro free trade, pro drug war, pro mass incarceration, and still call themselves a liberal. Are liberals ever going to wake up and realize that this is madness? More than that, why should people be shocked that these poor and desperate people, living in third world conditions thanks to policies the Clintons supported and enacted are jumping into the arms of Donald Trump – who at least seems on the surface to actually care about them? Donald Trump at least talks about being willing to reverse some of the trade policies that over 20 years on appears to have benefited only a tiny percentage of the richest people in corporate America, on the backs of American workers. It has been absolutely astonishing to see any advocacy for the American working poor either dismissed or deflected as yet another example of sexism. It has shown the elite support for Hillary Clinton to mostly consist of what I can now identify as corporate trickle down feminism – feminism that is obsessed about how wealthy, well-educated 1% women are performing in corporate boardrooms, with almost no concern about whether or not a poor single mother is able to earn a living wage. Perhaps one of the most clear examples of this kind of regressive identity politics can be embodied in the personage of Amy Siskind, a Wall Street 1 percenter who racked up an impressive resumé running the kind of Wall Street trading desks that destroyed the American economy in 2008. 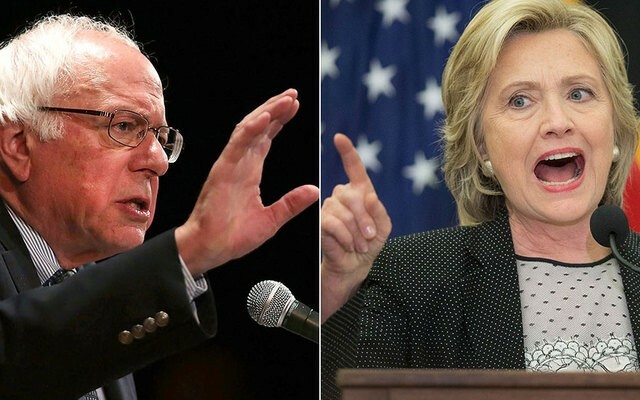 Just before the Michigan primary, she called Bernie’s criticism of Hillary’s support for free trade agreements ‘sexist’, because her record was distinct from Bill’s. 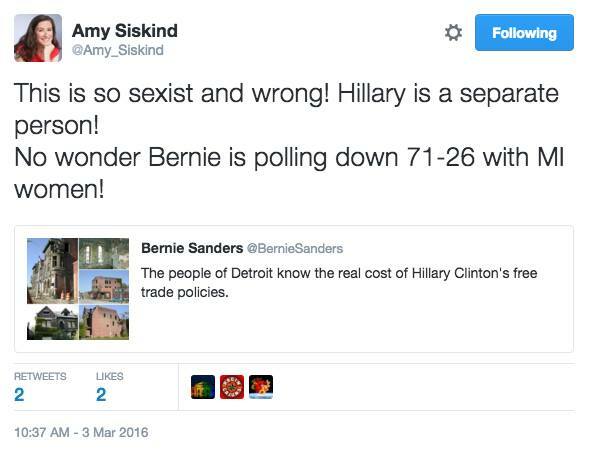 Over twitter, in an exchange that of course got me expelled from Amy Siskind’s safe space, I pointed out to her three separate instances in which Clinton vocally supported free trade. The response of this former debt trader? A typical regressive smokescreen. Don’t address the proof. Don’t address the evidence. Cry sexism. I’ve had to wake up and realize that the party that I thought actually did care about the poor on some level but was forced to tack to the right to win elections in the 1990s has actually never recovered from the “New Democrat” years. Barack Obama, with the signature moderately liberal accomplishments he has achieved such as healthcare and Wall Street reform, may be seen historically as an aberration from what is now coming back as a fully corporate party, with the only difference being the religion to which it subscribes and inspires voters to vote against their self interest. For years, big money used religion, mostly evangelical Christianity, to inspire working voters to vote against their own interests. Today they are doing it with a new opiate of the liberal masses – identity politics. It is amazing that in a country that still has such a shockingly high percentage of people that are either unemployed or underemployed in such a way so as to not be able to make ends’ meet that the ‘liberals’ are absolutely obsessed with whether or not Hillary Clinton has been addressed in a way that pleases the PC gods. That comments about her hair they find unsuitable light up social media like a Christmas tree shows that this segment of the party in fact may not get it . They may not understand the storm of discontent that would vote for Bernie Sanders, but if left with no choice may create the hurricane of Donald Trump, taking America in a direction for which we are unprepared and do not want to entertain. I hope I’m wrong. If Hillary Clinton wins the nomination – which looks likely at this point – I will do everything I can to get her elected. But even if Trump loses this round, the Donald Trump movement is going to be with us for a long time, and we should fear round two even more if we do not make fundamental changes to the economic policies of this country. I fear that identity politics may absolutely blind Hillary Clinton supporters to the coming storm. That Hillary has been called fat and shrill – this is what the regressive leftists might still be talking about when Trump has his finger on the button, ready to push.